The temperature outside is steadily rising and the latest weather forecast says that it will touch 18 deg C this weekend! The delicate snowdrops and colourful crocus are blooming everywhere and the daffodils are almost ready to spread their sunshiny cheer! It feels like the winter is at its teetering end in my neck of woods. In the last 13 years of winters in the UK, this year has been the mildest and short winter ever. Last year, we were still buried under the blanket of snow until April, and this year I have seen more sunny days than in winter than all the winters in the last decade put together! Talk about global warming! 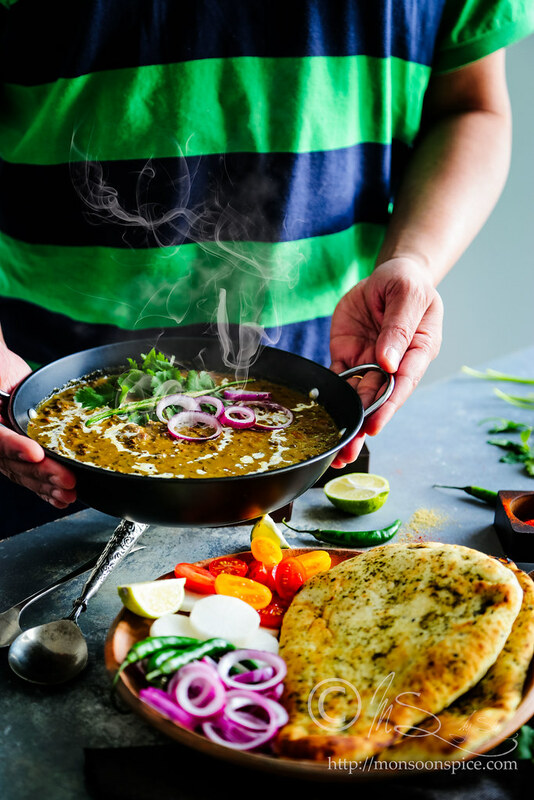 Before we bid adios to winter and winter produces, especially winter greens, I am making the most of them by cooking all my winter favourite dishes from India. 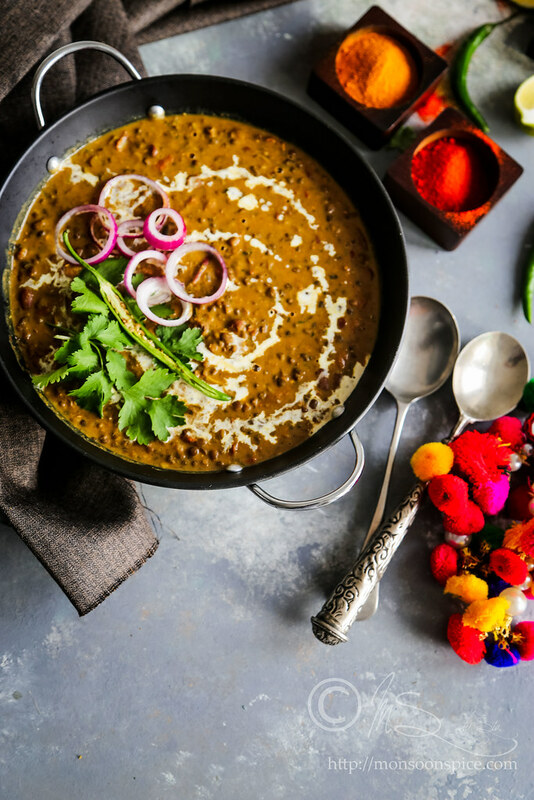 The ingredients you see here are used in making one of my most favourite winter dish from the land of 5 rivers. 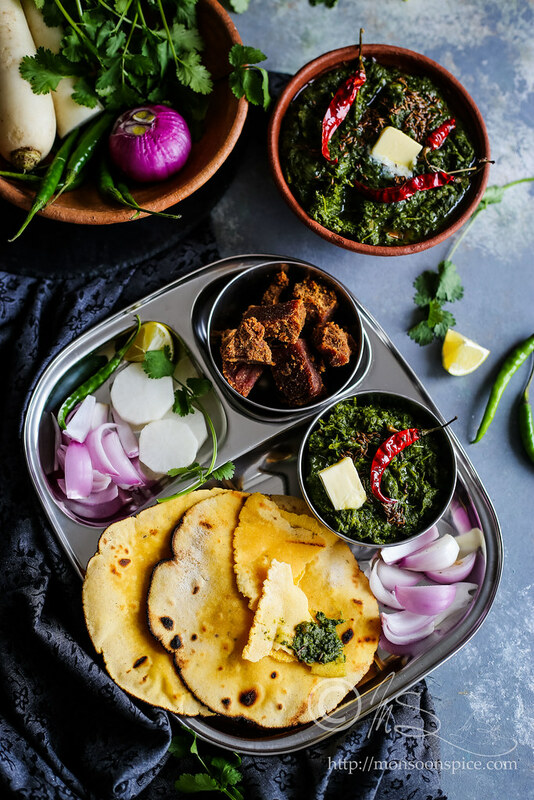 It’s Sarson ka Saag or in simple words, mashed mustard and winter greens. 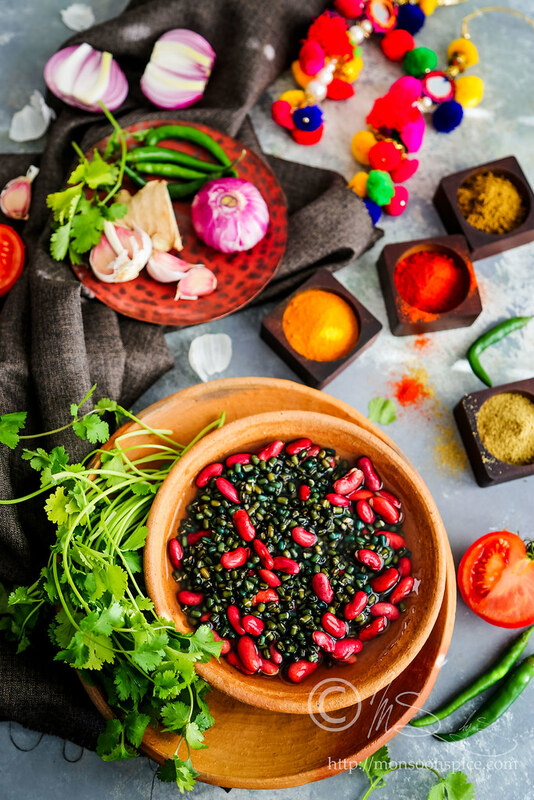 Saag is a generic name for cooked and pureed green leafy vegetables like mustard greens, spinach, fenugreek leaves, kale, spring greens, coriander and even mint leaves! 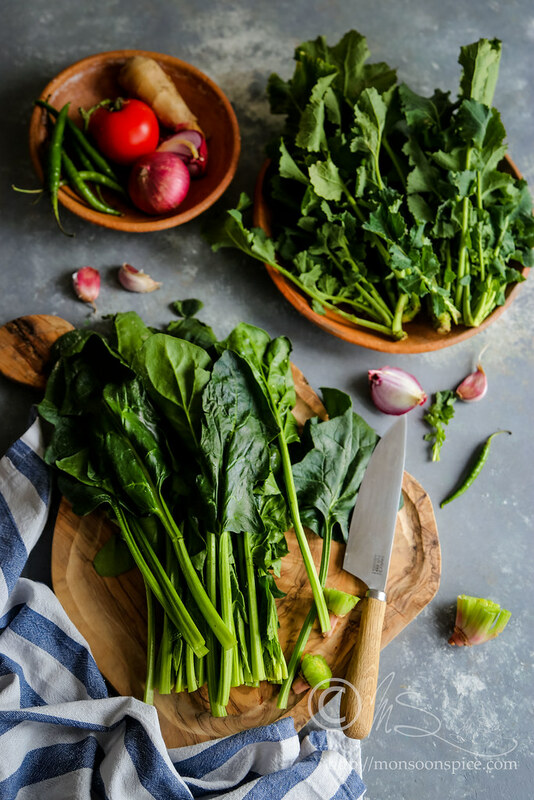 Unlike spinach greens, which takes just few minutes to wilt and cook, saag takes much longer time as the greens usually have thick leaves and veins which take long time to break when cooking. I don’t call myself a patient cook, but once in a while when there is a special occasions like my loved one’s birthday, I pour my energy and every bit of me into making something special to celebrate the special days of my loved ones. 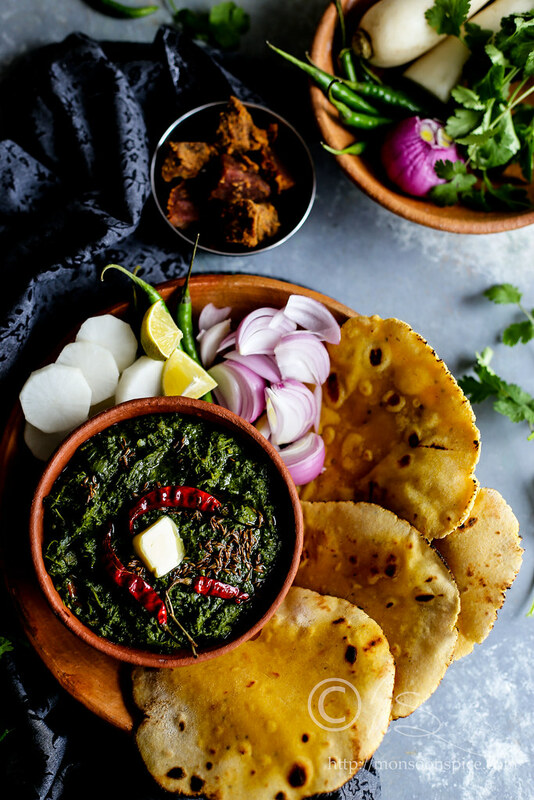 Like every year, I cook something new which they have never tried before for birthday dinner and this year for my husband’s birthday I cooked this classic combination of Sarson ka Saag and Makki ki Roti. Bombay-Goa highway, few hungry students, time well past the lunch hours, speeding bikes at 100 kms per hour, hot and sizzling afternoon… With few ten rupees notes stuck in our pocket we obviously didn’t dare to enter some plush and expensive restaurants with swanky ambience and attentive maitre d’ to greet us with fake smile plastered on his face that didn’t reach his eyes. We took a detour to one of the small eat-out joints where you can’t expect to see plush chairs and tables in an air conditioned room with soothing music playing in the background. Here you will hear blaring sound of Bollywood music and see one small shed which is a cooking area with tandoor (earthen oven half buried in ground) in one corner and huge gas burners with large cast iron sauce pans and kadai or woks bubbling delicious food with most amazing aroma that tickled your nose even from hundreds of meters away. In an open air, the coir woven wooden cots and a big wooden plank served as a seating and table arrangements. Then came our maitre d’, a small boy in a blue checks knickers and vest who greeted us by slapping a big steel tumbler of water on the rickety table. When we asked for the menu, the little boy started rattling off without pausing for breath… With some training the boy surely could give Shankar Mahadevan run for his money with his own album called ‘Dhaba Breathless’ ;) Within few minutes we were served tandoori roties, red onion and green chilli in a big Thali and array of curries filled in generous sized bowls. It didn’t take very long for us to lick the plate clean while the Daler Mehendi sang away ‘Bolo Ta Ra Ra’ in the background.